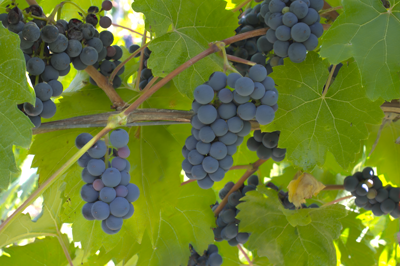 An inter-specific red hybrid wine grape variety that was named after the French marshal Ferdinand Foch (1851-1929). Developed in Alsace, France by Eugene Kuhlmann, Foch is an early-ripening, cold-hardy variety that is resistant to fungal diseases. Maréchal Foch is also a sister variety of Léon Millot (Foster). With small berry size, this varitety makes a variety of styles of wine, ranging from a light red wine similar to Beaujolais, to more full wines with intense dark colour and unique character. Great as a blender or in Port style wines. Maréchal Foch tends to have strong acidity, aromas of black fruits. Well-balanced, high in sugar, Maréchal Foch makes nice wines which can be consumed young.